I love a good Christmas fruitcake, which makes me deeply uncool, right? Wrong, stooges! 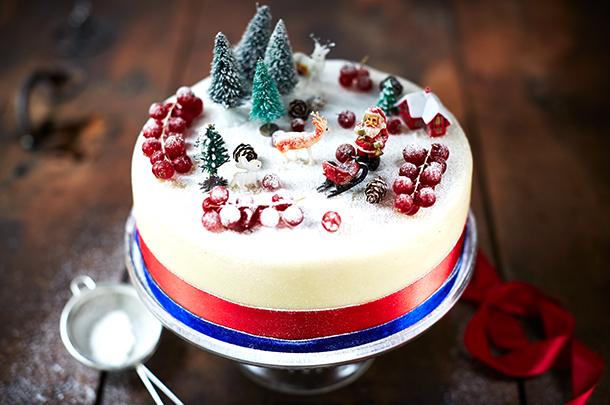 Let me be clear though, I’m talking about my Christmas cake – a lighter, tastier, more-sponge-less-fruit Christmas cake. I’m not going to be shy about this one – the recipe is utter genius, and every fruitcake-hater I’ve ever tried it out on concedes that it’s good. It has beautiful plump pieces of easily identifiable delicious dried fruits, not miscellaneous clumps of bitter, black-coloured maybe-raisins and something-like-sultanas that stick to your fillings and make your jaw ache. Some traditions are sacred though. I do like it with a bit of rustic marzipan icing on top, and I insist on a dusting of icing sugar and a selection of random plastic Christmas figurines to jazz it up – I’ve got a Santa, half a sleigh, some trees and a deer. Failing that, you can use a good Royal icing like on Jamie Magazine’s gluten-free cake to make a snow-scape on the top. Baking preserved fruit into a cake is said to have originated around the Twelfth night celebration. This is the night before the last day of Christmas celebrations according to the Christian faith, and often a “Twelfth cake” was made to celebrate, incorporating any leftover Christmas pudding into the cake mix. Over time, as exotic fruits became more readily available, fruit cakes became more elaborate and often used as table centerpieces, with their decorations becoming more glamorous – think sugar-frosted whole fruits and satin ribbons. Historically throughout Europe, dried fruit has been used in many bakes, not just Christmas cakes – for example German stollen or Italian panforte could be described as versions of a cake with added candied fruit. In the Caribbean, black cake is a still popular cake made with dried fruit soaked in rum, often over a long period of time, making for a really dark, rich and heavy cake. Mine’s not quite as intense as this – in fact it could really be called “Fruitcake for sissies” – but when it tastes this good who cares? Merry Christmas from Bee’s bakery! This recipe is really forgiving, so choose fruits that you love, as the final cake will still be a cracker! Go heavy on the apricots and cherries if you want a lighter, fresher-tasting cake, or go heavy on the figs and prunes if you fancy a rich, darker cake. Leave enough time to soak your fruits overnight before making and baking – it makes all the difference. Store your fruitcake wrapped in parchment and then foil – it’ll keep for around six weeks in a clean tin. Don’t feel you need to feed your cake with alcohol – by pre-soaking the fruit and choosing lighter and more flavoursome fruits, there’s no need to add extra the booze, in my opinion. 900g dried fancy fruits like apricots, dates figs, prunes, glacé cherries, dried blueberries, and candied peel, chopped into 1cm pieces. 300g of soft brown sugar – a combination of light brown and darker muscovado works well –again, use more of the former if you want a light sponge, and more of the latter if you want a bit more colour. 150g shelled and roughly chopped nuts – I especially love pecans, but hazelnuts or almonds are good too, and less expensive. The night before you bake your cake, warm your liquid by simmering in a small pan (do not boil it), then pour over all of your dried fruit and zest in a bowl. Mix thoroughly and leave to cool and soak overnight – your fruit will be juicy and plump in the morning – perfect for baking. Leave your butter out of the fridge overnight too, to soften up. On the day, pre-heat your oven to 160°C/325°F and double-line a round 20cm baking tin with parchment, leaving a couple of cm sticking out of the top. Combine your soft butter with the sugars in a food mixer or, if you’re working on toning up your biceps, go for it by mixing by hand in a large bowl. Cream until a light fluffy mixture forms – it’ll be lighter in colour than what you started with – the fluffier the better. Crack in the eggs one at a time, with a little spoonful of the almonds each time to stop the mixture curdling. Once combined, add in the flour, baking powder and the remainder of the ground almonds, plus the nuts, and mix until just combined. Then add in the pre-soaked fruit – there shouldn’t be much liquid left at the bottom of the bowl, but do add in any dribbles that are left. Mix well, scraping down the sides of the bowl to make sure everything is combined. Pour the mixture into your cake tin until it’s 3/4 full and ensure the top of the mix is flat, so you get a nice evenly-topped cake. Depending on your mix you might have lots left over, so just make another smaller cake or lots of little Christmas cupcakes. Bake for one hour, then turn the cake around (in case your oven has any hot spots), reduce the temperature to 150ºC/300ºF and bake for another hour. Check the cake to see whether it’s done by inserting a skewer or the tip of a thin-bladed knife – when its done, there might be a couple of crumbs sticking to the knife, but there should be no raw mixture. It might need up to another 30 minutes depending on your mixture. Leave the cake to cool inside the tin so that it keeps its shape, and when ready to serve, either dust a little bit of icing sugar on the top, or cover in marzipan and decorate however you like best! It also keeps really well, so I tend to bake my Christmas cake in early December before things go completely mad at the Bakery with Christmas orders.